Today I upgraded my Gentoo systems to nvidia-drivers-180.41. I had bad news to report the last two times I upgraded nvidia-drivers in nvidia-drivers-180.37 causing strange segfaults and CTRL-C and CTRL-Z not working after nvidia-driver upgrade and high CPU usage. Well, since I had bad news before I also want to tell you about the good news. I did not experience any problems yet with nvidia-drivers-180.41. I run Gentoo with kernel 2.6.28-zen4 #1 SMP PREEMPT on x86_64 and tried with Quadro FX3400 and Quadro FX350M. Even tuxonice works on my Dell Precision M65 with the driver. In the past I sometimes had problems with suspending and some nvidia-driver versions. Well, not everyone is as lucky as I am. Some cards seem not to be recognized anymore by the driver. You can read about this problem on 180.41 — no more support for 6600? I’m quite happy to have a new working driver after the last two upgrade attempts. Edit: Sadly I was wrong in this post. nvidia-drivers-180.41 also causes segfaults as well as 180.44 does. These segfaults occur during heavy CPU/MEM usage. (In my case running 6 instances of mencoder simultaneously on 4 cores). After downgrading again to 180.29 everything returned to normality. I just fixed some bugs and implemented a slideshow mode in SIV, the viewer for stereoscopic jps images, I published in SIV – a stereoscopic jps viewer for Linux. As I wrote before in VR920 headtracking driver for Linux I want to extend the viewer using the tracking data from the VR920 HMD, so one can look around the scene by turning his head. Once this work is done you can enjoy a new experience in 3D. So expect the download of a newer version of SIV to appear soon on MyGNU.de. In the meanwhile you may want to share your experiences with the viewer. What do you like the viewer for? What do you think should be improved? The driver sends the tracking data as UDP multicast, thus many clients may read the data, which makes parallelisation more possible, i.e. one could use one machine for rendering and another machine for calculations. 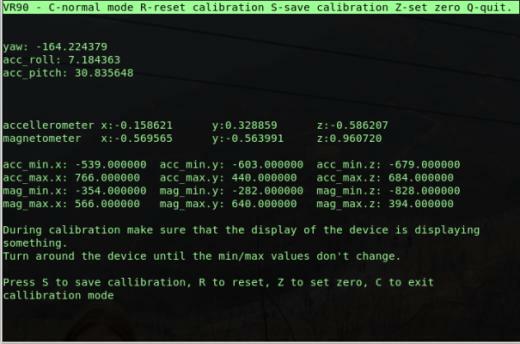 The calibration works similar to the windows driver, one has to turn around the device until no values increase anymore. I still have to improve the calibration mechanism. It still lacks the set zero feature. Also I have to make movements appear more smooth. Well, these are more or less minor problems and I should solve them soon. So expect to see a download ready version soon on mygnu.de. Today, while performing a large world upgrade on my gento x86_64 system, I noticed almost every build segfaulting (internal compiler error…). In the meanwhile I was encoding several videos (xvid) with avidemux. thus I had a somewhat high memory usage. Some of the avidemux processes also segfaulted. I noticed these segfaults also yesterday, but thought something was wrong with my video files. After many segfaults the system then ran completely out of memory and I had to reboot. Because of my last experience with nvidias drivers (see: CTRL-C and CTRL-Z not working after nvidia-driver upgrade and high CPU usage) the nvidia-driver was my first supective. So I masked off nvidia-drivers-180.37 and downgraded to 180.29 again. Afterwads the segfaults didn’t occur anymore.